This page displays our entire online selection of excellent Hopi Indian Pottery. Hopi pottery is one of the oldest and most widely collected of all the Native American Indian pottery styles. It is descended from pottery made in the area for well over 1,000 years. The most common and well-known Hopi pottery is a clearly defined look marked by painted designs inspired by ancient Pueblo and Sinagua Indian ancestors on polished orange/yellow pottery. The Hopi’s ancestors traded yellowware pottery from at least the 700’s. However, following much struggle and violence with plundering Spanish, Apache, and Navajo, the trading declined, and therefore pottery making declined to almost nothing by the late 1700’s. In the early 1800’s, epidemic and drought forced many Hopi Indians to seek refuge near, and amongst, the Zuni Indians. There, the Hopis re-learned the art of pottery making before returning to their homeland years later. Around 1880, trader Thomas Keam came to the area and further encouraged pottery making, with deference to the pottery designs found in the abandoned village of Sikyatki. Soon, in the late 1880’s, the railroad reached the Hopi area and created a great tourist market for Hopi pottery. These events each had very large impacts on the resurgence of Hopi pottery. The founding story of contemporary Hopi pottery is that of the famed pottery artist, Nampeyo, and her relationships with ethnologists and archaeologists. In 1886, an ethnologist from the Smithsonian named J. Walter Fewkes excavated the abandoned village of Sikyatki. Mr. Fewkes wrote that he had shown the sixteenth and seventeenth century pottery that he had uncovered to the wife of one of his workers, Nampeyo of Hano. Nampeyo was already familiar with the designs on old pot shards of the area, and was even more impressed by whole pieces of pottery. She then further adopted the designs into her works. Nampeyo, and her pottery art, quickly became noteworthy. She soon did several exhibitions and demonstrations as far away as Chicago, where she introduced Southwest Native American Indian pottery to the world. By 1900, Hopi pottery artist, Nampeyo, had become the first celebrity potter from the Southwest. Nampeyo’s pottery style has largely defined Hopi pottery ever since. Her descendants now include around 100 potters through seven generations. Hopi whiteware is made primarily by another distinguished Hopi pottery family, the Naha family. 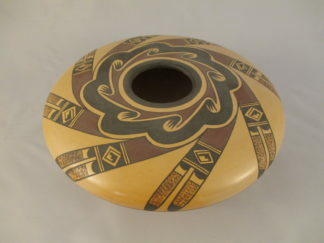 Paqua Naha is often credited with developing this unique style of white Hopi pottery, with black and red painted designs, around 1950. Paqua Naha signed her pottery with a small drawing of a frog, and so she became known as ‘Frogwoman’. Paqua’s daughter, Joy Navasie, signed her pottery with a slightly different frog, and was also known as ‘Frogwoman’. Paqua Naha’s son married Helen Naha, who learned and produced the whiteware pottery as well, but signed her pottery with a drawing of a feather. She thus became known as ‘Featherwoman’. Pottery artists on either side of the family have created their own versions of the frog or feather signature ever since. A smaller number of Hopi pottery artists create bold carved pots that require thicker walls, more texture, and great drawing skills. Some Hopi potters have developed great sculpting skills, while others excel at making Santa Clara-like sgraffito pottery. 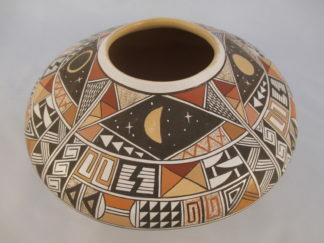 Hopi pottery is beautiful and diverse with both innovative and ancestral designs. At the same time, Hopi pottery is very deeply rooted in ancient traditions and family connections.